For decades we've been leaders and innovators in the designing and manufacturing of sails across the west coast and throughout the US. We're one of a few, select sail makers partnered with Banks Sails. Under Dale Waagmeester, Banks Sails Northwest has long been known for quality, knowledge, experience and expert craftsmanship. Click here to learn more about Banks Sails Northwest. 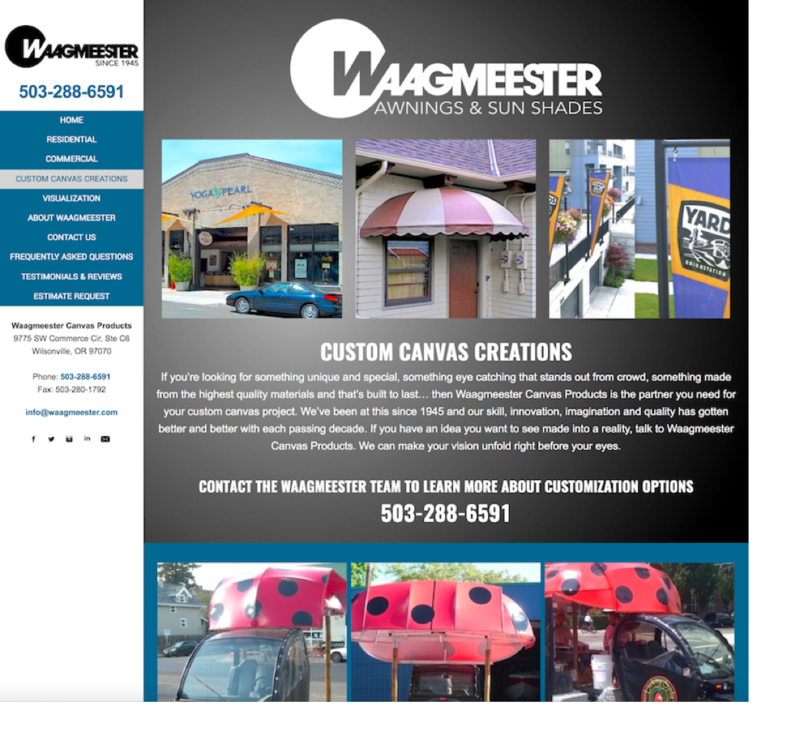 Waagmeester Canvas Products is the top designer and fabricator of fixed and retractable awnings and sun shades (sun screens) for the Willamette Valley and throughout the Pacific Northwest. Click here for our awnings page or for even more info on our high quality awnings and sun shades, check out our dedicated awning website www.PortlandAwning.com. When it comes to industrial canvas needs, Waagmeester Canvas Products is the only team you need to call. Whether you want to create and display an artistic piece with a big "WOW" factor or you're looking for large scale canvas pieces to cover and protect heavy machinery and equipment, the pros at Waagmeester can create the custom canvas to fit all your needs. Big or small, Waagmeester is your source for industrial canvas creations, click here for more. Fun, recreational, fantastical, practical, even impractical - when it comes to custom canvas creations, Waagmeester Canvas Products does it all. The only limit is your imagination. We've created custom pieces for homes, businesses, non-profit groups, private associations and more. Click here to see just some of the many exciting projects we've worked on. Canvas isn't just sails, tents and covers. At Waagmeester, we turn ideas into reality. If you need it covered, talk to the canvas experts at Waagmeester Canvas Products. We've got over 70 years experience custom making covers for everything from boats to buildings, cars to machinery, and anything needing protection from the sun and weather. We've made canvas HVAC and heavy equipment covers, custom vehicle covers, dome covers... you name it, we've done it. Check our our Canvas Covers page here. Since our original founding in 1945, Waagmeester Canvas Products was located in the heart of Portland, Oregon at 12th & Alberta St. We grew so large in those in those seven decades that we actually occupied an entire city block! In February of 2017 we relocated to our larger, state-of-the-art facility in Wilsonville, OR. We welcome you to stop in and see our shop. We'll be happy to demonstrate our design and fabrication abilities and help you start planing your next project. Click here for more on our shop. As a third generation, family owned and operated business, Waagmeester Canvas Products is steeped in a proud family history and heritage. 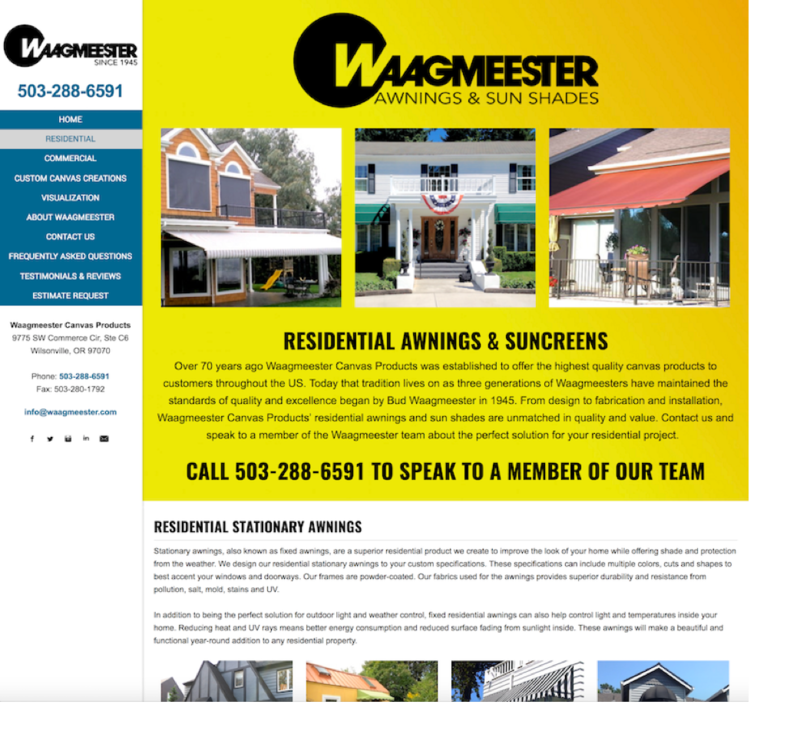 Founded in 1945 by Bud Waagmeester, our family of companies has grown to include Waagmeester Awnings & Sun Shades and Waagmeester Industrial Canvas. Now, more than 70 years later, the Waagmeester name continues to denote the highest level of quality, craftsmanship and customer service. Learn more about our history by clicking here. While you can find lots of great information on our high quality awnings and sun shades on this website, we'd love for you to have a look at our newly launched website dedicated exclusively to our awnings and sun shades. 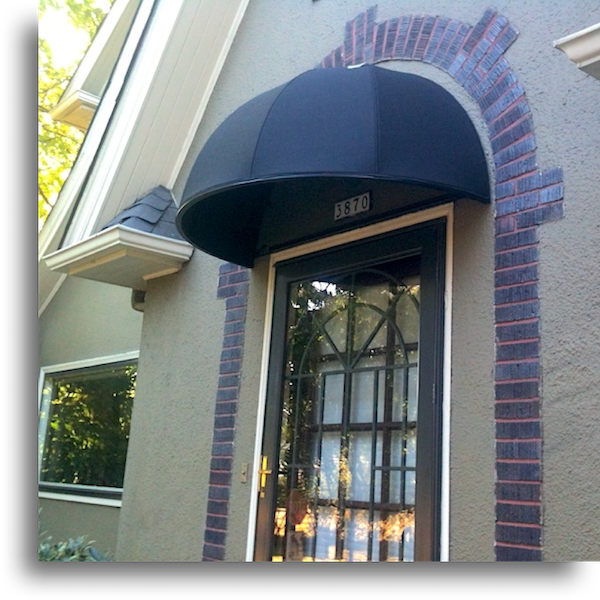 ​This new website was created for and is dedicated exclusively to our residential and commercial awnings and sun shades. You'll find galleries, specs, information, an awning or sun screen estimate request form, images of our visualization software and much, much more. 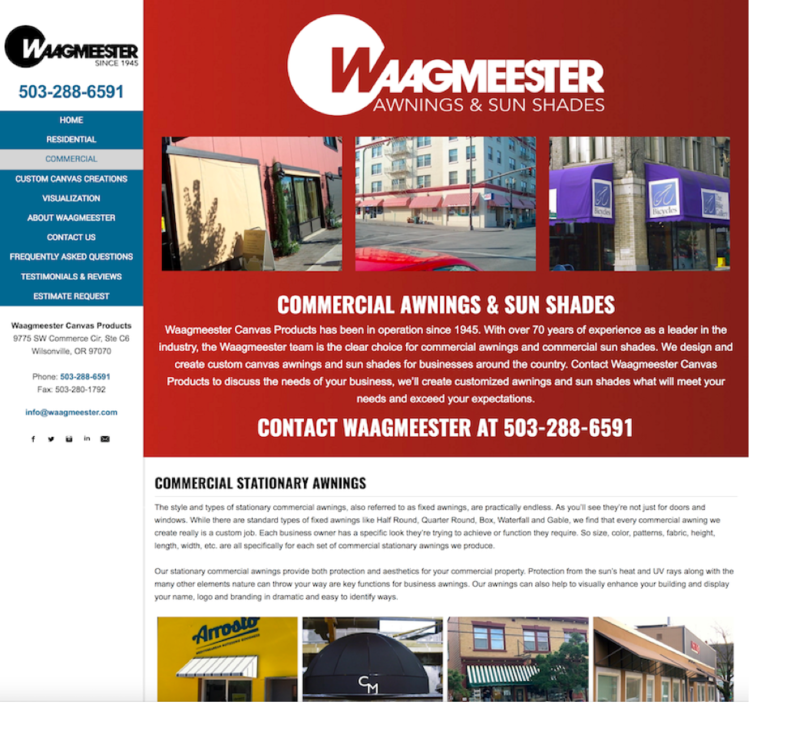 Just click either the www.PortlandAwning.com link above or the Waagmeester Awnings & Sun Shades logo above to be taken to our new site. You may also click any of the images or titles to open a new window for our Home page, Residential Awnings & Sun Shades page, our Commercial Awnings & Sun Shades page or our Custom Canvas Creations page. There's lots to see over at PortlandAwning.com and we hope you'll take a look.